I was surprised to be woken at 0130 by marked pitching and rolling, together with stifling heat in the dorm. I was unable to return to sleep, so a walk around the ship was in order. It really seemed quite rough on deck, with water sluicing from one side of the deck to the other in the bar. There was standing room only in the bathroom, with many people talking down the porcelain telephones. I decided it was too risky to wash my hands. Daylight revealed smashed glasses/bottles in the bar, a destroyed shop, and ashen faced officers smoking on the back deck. Apparently it was a force 9 with 10m swell, 95 knot winds. 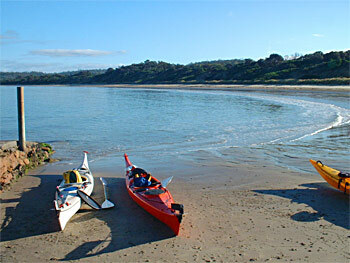 Eventually got into Devonport (late) and set off for Freycinet. It teemed down with rain, absolutely torrential, so we stayed in Bicheno at “The Cosy Cabins”, which were indeed. Set off for Coles Bay in 30 knot winds and heavy showers. Went off the idea of camping on the way, so booked into YHA before setting off from the jetty, heading south following the coastline. 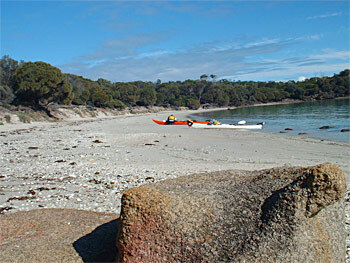 The coast is beautiful ochre granite boulders with heavy forest growing almost to the water. The cloud cover was too low to see “The Hazards”. Left the lee of the coast about 1k past Parsons Cove into 30 knot Southerly, 1.5m swell. As usual a standing wave broke over my head, trickling down inside my cag to pool in my groin. Followed the cliffs south to Hazards Beach, via Refuge Island. We walked over the track to Wineglass Bay, and were not really impressed as the dull conditions did not do it justice. 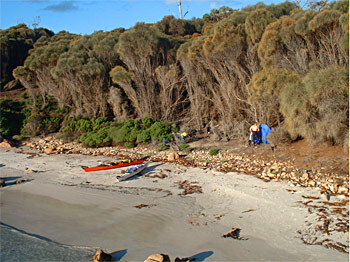 Flew back to Coles bay with the wind and swell at our backs,picked up a few nice surf waves near the jetty. Wet and cold at the end of all this, very happy to have hot shower and fire at YHA. There was obviously a rule at this hostel that talking was not allowed. When a conversation starter was aimed at them, the gregarious patrons lowered their eyes to the floor and muttered a monosyllabic response, typically beginning with “U”. The introverts continued staring silently at a fixed point on the wall opposite them. We went to the hotel. Awoke to great weather, beautiful blue skies with a puff of wind only and the Hazards revealed. Packed our boats next to a kayaking day trip which operates from the jetty, with many interested onlookers. Big Red packed about 5000 sets of clothes (even though he seemed to wear the same ones all the time) and then reckoned he didn’t have room for all the beer! This was the lowest moment of the whole trip. 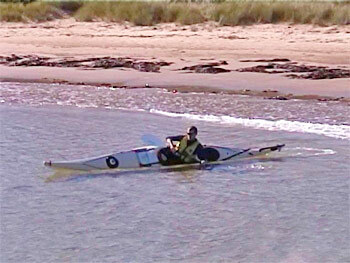 Big Red protests that 5000 is a scurrilous exaggeration – he claims to have packed only 4991 sets of clothes, but otherwise admits it is true, he wore only 1 of them!A pleasant trip South along the same route as the day before, calm conditions and millpond sea. Incredible water clarity with sea bed clearly visible 30 feet down. 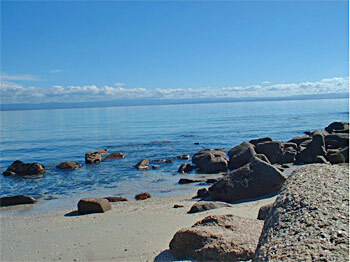 Lunched on Cooks’ beach in perfect conditions,with views of the southern side of the Hazards. 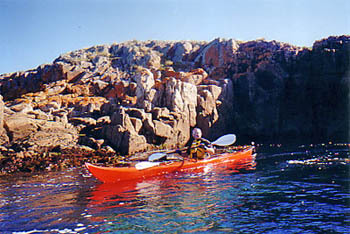 We continued down to camp in a small cove between Bryans Beach and Passage Beach, arriving in clear blue skies and about 22 degrees. Caught 2 large wrasse off rocks, one on first cast (about 2 kg) and one larger. Saw a heavy dark band of cumulus approach slowly from the west, with rain beneath. Was entertained by a pod of 4 dolphins leaping and racing about 100m offshore. Battened down the hatches prior to a heavy squall then dumped on by constant rain, putting our campfire out. I neglected to bring waterproof trousers or boots and so retired to bed early at 1930. This was the first night I had slept in my hammock and was very happy, remaining dry all night and sleeping 12+ hours before being woken by John who had been up since 0530. As I said to him, I had my hat over my eyes and thought it was still night time. Dry today, with 10-15 Knot southerlies. 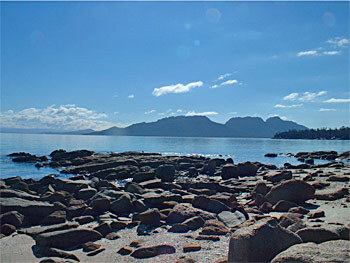 We had planned to circle Schouten Island and crossed Schouten Passage to the northern side of the island. We checked the met with a yacht at Schouten and learned of an expected Southerly of 30+ knots sometime during the morning. We changed our minds about circumnavigation after learning this and simply explored the Northern shore. 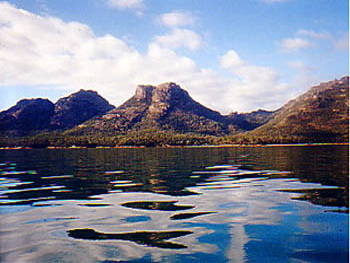 The geology of the southern part of Freycinet and Schouten seems quite different to the north, and Schouten is different again from the mainland with a very deep drop off, large kelp beds and large segmented limpet-like crustaceans on the rocks. Crossed back to the tip of the Peninsula late morning as the wind began to blow up. Explored the coast as we followed it back up and landed mid afternoon on Cooks Beach, where we set up camp and made washing lines for drying gear from the evening before. The southerly soon blew over, leaving balmy conditions. Big Red went for a swim in the sea as I did later, but we still stank apparently. Late in the afternoon a group of four healthy looking young ladies walked on to the beach with backpacks. They seemed to be under the power of their evil leader who definitely played for the other team, and right enough they were shepherded to the far, far end of the beach to set up camp, provoking prolonged highbrow conversation at our end. Managed to stay up later this evening before going for another marathon sleep in the hammock. 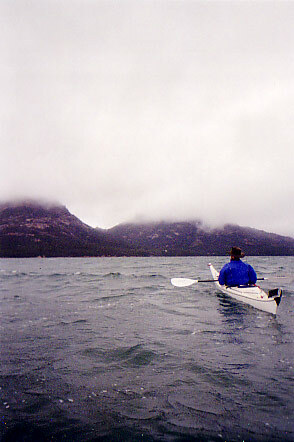 Wound our way back towards Coles Bay initially in millpool conditions, stopping for a few photos and video en route. Some interesting clapotis around the cliff faces towards the end, I made my first seal landing, landing high and dry when trying to paddle over a rock on a surge of swell. Impressive if unintentional. Landed at Coles Bay mid afternoon, meeting the same tour guide at the jetty as when we left, regaling him with tall tales until he made his excuses and left.We made the fateful decision to motor around to Swansea, apparently a town geared to tourists. Got a nice cabin at the caravan site, noting the poetic names given to people’s weekend caravans, including one called “Morning Glory”. Went for a beer early at the divey local pub, was distressed to find that the locals were actually backward pointy headed yokels. Repaired to the local restaurant where we had the worst meal I have ever had (including some of my own concoctions as a student). To be fair to Swansea, Big Red thinks he’s had a meal that was worse – about 25 years ago at a roadhouse west of Diranbandi (SW Qld). To be fair to Diranbandi, it was about 3.30 one Sunday morning, when the cook, having been arrested by the Health Department the night before, was replaced by the hastily seconded 17 year old bowser jockey who’d never cooked anything before in his life, and having been gelded the previous afternoon, wasn’t quite at his best. Continued on to the RSL for a consolation beer, the music about stopped when we came in, with glares all round. So, another early night. Had to leave early as road closures were imminent due to the Targa rally. Stopped en route at picture gallery to get a picture each as a memento, arriving early for the ferry. Uneventful trip to Sydney, with a few country classics on 94.1 FM to speed us home. All in all an enjoyable trip, but no challenging conditions save the first day on the water. Spent the whole trip on the lee side of the Peninsula, in Bay. Would be keen to venture outside next time, taking a VHF radio to allow checking of weather forecasts, as the Bay was very quiet and there were few boats around to obtain useful met advice.